Explore Berlin from a Trabant on one of our Trabi Safari Tours! 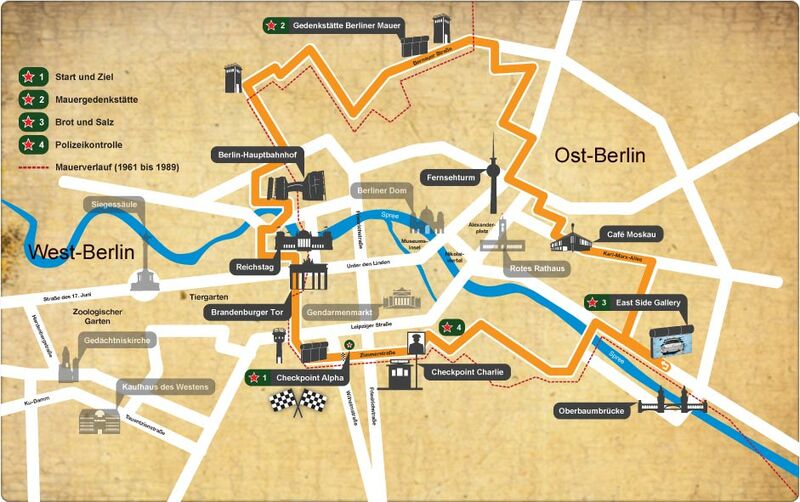 We offer three Berlin Trabi Tours: The Wall Ride, City West or Wild East Tour. Drive along the locations where The Berlin Wall divided Berlin in two and also see the famous places where Berlin got unified in 1989. Steer your vehicle along the relicts of Marxism and Leninism to the East Side Gallery (a 1-2 km long piece of the Berlin Wall). Here we'll make a stop to get some tea with bread and salt (very Eastgerman). Explore the death strip and pass the rigorous document inspection at Checkpoint Charlie as in “the good old days”, just as it has happened as a part of everyday live in the divided city. The City West Berlin Trabi Safari is the tour for you who like to get a balanced information mix of Berlin and see Berlin's classic sights. This tour takes you to such highlights such as Potsdamer Platz, KaDeWe, Straße des 17. Juni, Brandenburger Tor, Unter den Linden, and Checkpoint Charlie. This Wild East Ride is for those of you who like to venture off the beaten (tourist) path. Here you will get some insider knowledge of the city, not all knows. Most of this tour is through the former east part of Berlin and includes highlights such as Checkpoint Charlie, TV Tower, Alexanderplatz, Unter den Linden, Brandenburger Tor, Holocaust Memorial and Postdamer Platz. All tours are operated in English. Shortly after your booking is complete your e-ticket will be sent directly to your email, just print it out and bring it you to Trabi World. All Berlin Trabi Safari Tours starts and ends at Trabi Safari/Trabi World. The exact address is on your e-ticket. How many does a Trabi fit? A Trabant fits four people. So are you 2-4 people you will get 1 Trabi. If you are more than four people you will get two Trabis and so on. Prices are per person - not per car. Can I book a Trabi for one person? No, you must be minimum 2 people when booking any Trabi Safari Tours. You cannot book for just for 1 person. No, you do not need an international driver license, your national driver license is fine. What if I don't have a drivers license? As all the Trabi Safari Tours are self-drive tours, one of you needs to have a valid driver license, as one of you most likely will drive the car! If none of you can drive a car, you cannot book these tours! What if two people want to drive? If more than one of you like to drive the Trabant, please bring valid driver licenses for all drivers who'd like to drive. You will only be allowed to drive if you have a valid driver license to show at the beginning of the tour. The price includes full insurance, with a EUR 300,- deductible self-coverage if an accident happens and it is you, as the driver's, fault. What language is the audio guide in? The audio guide over the radio in the Trabi is in English. Children under age 15 are free when accompanied by a paying adult. Diifferent departure times, depending of Trabi Tour – please see under each tour on the left!